Thoroughly enjoyable book, was gripped from start to finish. Not bad but not what I was expecting at all from the blurb on the back. However, I ran out of books while on holiday and it happened to be among the books you could borrow in reception so it kept me occupied for a few days. Joe Lucchesi has recently returned to his job as a detective in the New York Police Department. He, his wife and teenage son have returned from life-threatening incidents in Ireland where Lucchesi's family were threatened, his wife tortured, his son's girlfriend killed and their peace of mind destroyed by a deranged killer. That killer was never caught, and he won't leave Joe alone.In the meantime, Joe and his partner are part of the team investigating a series of extremely violent deaths, where for some inexplicable reason, a killer is mutilating the teeth of his victims. Initially the killings were thought to possibly have some homosexual element, but as the number of victims increases and two survivors – one female, one male are identified, the reasons become even more obscure. Along with the phone calls from the killer who tortured his family, Joe is also receiving letters from somebody who knows something about this current case.THE CALLER is the second book featuring Joe Lucchesi, the first being Darkhouse. THE CALLER covers the period of time after the family have returned to America and the immediate aftermath of their experiences. Joe's wife Anna is housebound, scared, and scarred physically and mentally from an ordeal covered by the earlier book. Joe's teenage son Shaun is rebellious, dealing with his trauma by drinking too much and causing problems for his parents at every turn. Joe is tied to his work, guilty about what happened to his family but unsure what to do other than try to recover his position as family head and protector.THE CALLER concentrates fairly heavily on Joe and his family, and to a certain extent, the personal lives of the other member's of Joe's work team. There are a lot of references to the back-story – – none of these are overly fleshed out, but they do provide a précis of the past. Whilst the provision of some back story detail is always preferable to the assumption that the reader will have read earlier books in the series, the level of concentration here gave THE CALLER a feeling of constantly looking backwards and a real disconnection with current day events. Those current events - a serial killer with a distinctive MO, ended up as a fairly pedestrian serial killer plot. Seemingly disconnected victims, an unknown perpetrator, unidentifiable by unexplained survivors, an accumulation of clues and information from friends and family of the victims, and a sudden connection. Bit of cop-jep and a twist at the end which was obviously coming, but elegantly tied off by the author.Whilst it seems that the back-telling of Joe's personal story; the concentration on Joe and his family; on Joe's feelings and thoughts; are designed to flesh him out as a character, the book lacked focus and direction. It maybe that reading Darkhouse first would give THE CALLER that focus, but on its own, the back fill was more distracting than illuminating. Combine that with a reasonable but predictable serial killer plot and THE CALLER didn't quite live up what it sometimes threatened to promise. Time taken to read - 4 daysPages - 406Blurb from GoodreadsBack on the job after a year out, NYPD Detective Joe Lucchesi becomes the reluctant lead in a high-profile investigation. Battling with physical pain and tension in the task force and at home he struggles to make progress. Then just when he feels close to making a breakthrough, the investigation is rocked by tragedy.My ReviewJoe Lucchesi is back, after one years leave after a horrific event him and his family endured he is now investigating a serial killer. One who bashes his victims faces in, takes them through a ritual and reach out to seemingly random people. He struggles between his private life, his wife and son are still suffering the effects from what happened in the previous book and the case is high profile.For me, I think the biggest issue was that I hadn't read the previous book I just picked it up not realising it was part of a series. There is a lot of reference to book one, the Lucchesi family are all struggling to recover from whatever happened and not knowing the full story probably impacted on my enjoyment. There are twists and turns in the book, it goes at a decent page and it does engage you but for me I felt there was heavy focus on book one which I missed out on. I would certainly read this author again but I think I would go and start at book one, I think people who have read the first will no doubt really enjoy this one, 2/5 for me though. Un tueur en série qui s'attaque à ses victimes chez elles, sans effraction, comme si elles l'avaient laissé entrer... Qui leur fracasse le visage et leur fait passer un étrange dernier coup de téléphone avant de les tuer.Un enquêteur à la famille meurtrie par un autre tueur, qui va pourtant devoir arrêter la tuerie...Une écriture fluide, visuelle, à suspense et pas dépourvue d'humour...Il aurait pu être intéressant de s'intéresser un peu plus au tueur et à son étrange manie de faire passer un dernier appel à ses victimes - mais le roman est plutôt écrit du côté des enquêteurs et des témoins, point de vue qui permet plus de suspense, choix qui se respecte.En résumé, un très bon roman, dont vous risquez d'avoir du mal à sortir...L'extrait"Ils entrèrent dans le bureau d'Ethan Lowry.- Ca le fait plus, commenta sobrement Joe. Tu vois ce que je veux dire, la pureté des lignes?- Les gens adorent les séries policières et les émissions de déco. Si tu maries les deux, Joe, t'auras le taf de ta vie. Pense un peu à l'audimat: Les Experts font votre Relooking extrême.Joe s'esclaffa malgré lui, aussi Danny poursuivit-il:- L'inspecteur Joe Lucchesi: il enquête sur votre mort et sur vos goûts. Quels ont été vos derniers déplacements? Et pourquoi avez-vous choisi d'assortir ces rideaux-là avec ce tapis. Le mystère sera résolu après la pub. Cette saison, c'est le vert qui fait fureur dans les cuisines. A propos de fureur, les coups de battoir sont..."
Started reading this book but am getting bogged down by the oblique references to what happened before, in the previous book, which I haven't read.Joe, his wife Anna, and son Shaun, have obviously had something horrid happen to them when they were living in Ireland. It impacts on the story because the perpetrator of that evil keeps contacting Joe, and he has to interrupt his work day to check in on Anna, who is quite obviously suffering from the after shocks of the previous trauma. In addition, their son is also having problems related to the incident in the past and is acting out in school and getting drunk all the time.The case Joe is covering has a murderer who bashes his victims in the face and then shoots them. As always, the murderer is found but there are some unanswered questions. I can't ask them here because I don't want to spoil things for others.Not sure that I enjoyed this book. It was missing some connections that bugged me. Ho letto il primo episodio della serie (Luce Nera) in italiano e, devo ammettere, che questo secondo capitolo scorre molto meglio del precedente. Forse perché ero preparata allo stile, ai paragrafi brevi che spesso sembrano sovrapporsi... forse perché nell'edizione inglese non ci sono troppi errori di impaginazione... ma la lettura è stata più fluida e rapida. La trama mantiene alcuni dettagli prelevati dal primo libro, come se si volesse conservare la continuità, ma non tutti i nodi della vicenda sono ancora venuti al pettine. Il finale perde forse un po' di intensità, come se si sgonfiasse a poco a poco prima di giungere alla grande rivelazione, però - fortunatamente - il dubbio sul colpevole resta fino alla fine. This was the first Alex Barclay book I've read, it kept me gripped to the end. Now I know I read it in the wrong sequence but am glad as the reviews written all go on about the first being better but since I haven't read that yet, I can say this is a page turner, keeps you in the moment you pretty much don't want to put the book down,(nearly missed my train stop! ).Now to go back and buy the Darkhouse and find out what went on with the main characters! ps it's hard to write about the characters as each would spoil the read, so, just get the book and trust me, you will enjoy the read! Detective Joe Lucchesi has just had a year out from work to recover with his family in Ireland (Darkhouse) after a psychopath targeted them all.Still in pain from his injury and struggling with family issues, Joe becomes lead detective when people are being murdered in their own apartments, faces savagely beaten, bodies discarded in their hallway for someone to find. Join Joe as he investigates these horrendous attacks, before the killer can strike again ...Great reading, would easily recommend this book. Schwache Charaktere, zu viele "private" Hintergrundinfos, die für den Hauptplot uninteressant sind... der Spannungsbogen baut sich nur sehr langsam auf, dann wird es im zweiten Drittel des Buches endlich spannend, doch schnell bekommt man das Gefühl, dass der Autor zu einem Abschluß kommen möchte... und hopplahopp gibt es das dann auch. Sehr diffus und nicht nachvollziehbar. Mit der schlechteste Krimi / Thriller den ich je gelesen habe. This one was written more fluently then her first and I really like the characters Joe and Anna. The end seemed a little rushed and there was no explanation to it all. What was the motivation for the killer? What made him tick? And how did it all fit together? I liked it but I feel confused now that it's over. Although the story was good to start the characters were a bit weak and slightly unrealistic at times and the killer was quite disappointing by the last half of the book. The ending was confusing and anti-climatic and left me feeling quite disappointed. Overall a run-of-the-mill serial killer detective story with nothing outstanding about it. Another book I've read by an Irish writer that is an aquaintance. This was her second published book, "Darkhouse" was the first. 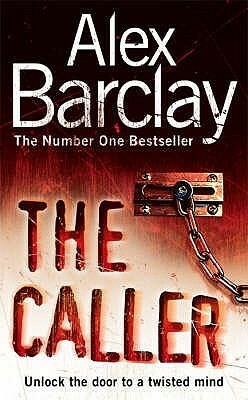 I liked Darkhouse better, just didn't think "The Caller" was quite as strong. Regardless, I look forward to reading more by Alex. Well written thriller, if a little confusing towards the end. A warning - this is clearly a sequel although that isn't made clear. And much of the plot follows on from book 1, making it difficult reading as a stand alone. The ending was one of the worst !!! What a tragic waste of time reading an otherwise good story. Not enjoyed at all. I gave up in the end to be honest. This is poor stuff. Flawed cops chasing a serial killer, and a confusing ending. Another really good read. I like this woman's characters. I like her stories. I can't wait for her next book! Started off a little confusing, but once I got further into it I really enjoyed it! A very well written second book, which I enjoyed very much although it was dark in places. I will certainly now read her first novel Darkhouse. Good book - plenty of suspense and characters with whom it was easy to identify. There were some loose ends and unexplained events, but overall it was good. Not as good as Dark House. Confusing outcome. Didn't rate the killer's motives. It was an ok read. It wasn't until I had started reading that I realised there was a prequel that you should have read in order to fully understand this one. Every bit as good as its predecessor! Alex Barclay - Barclay studied journalism at university and worked for a period in fashion and beauty journalism as a copywriter in the RTÉ Guide. In 2003, she left the fashion industry to write Darkhouse, the first of two novels featuring NYPD detective Joe Lucchesi. Her second novel, The Caller, was released in 2007, and Last Call in 2008. She won the Ireland AM Crime Fiction Award at the Irish Book Awards for her fourth novel, Blood Runs Cold.